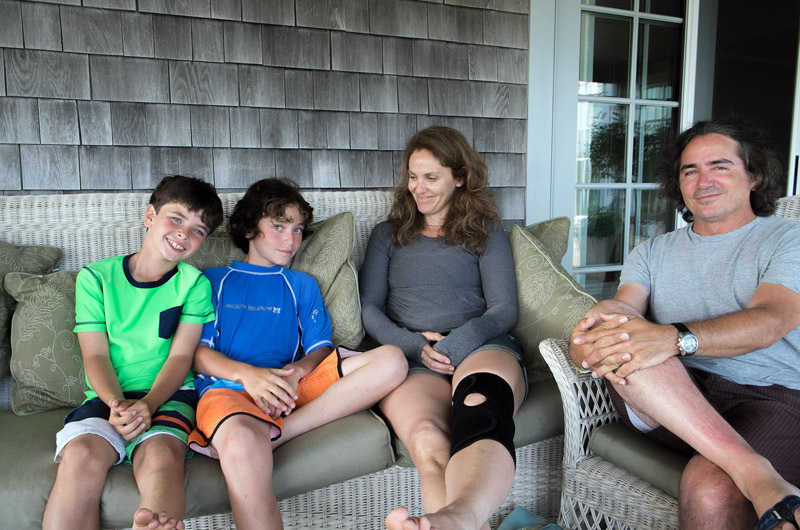 Brad Silberling and Amy Brenneman on their West Tisbury front porch. 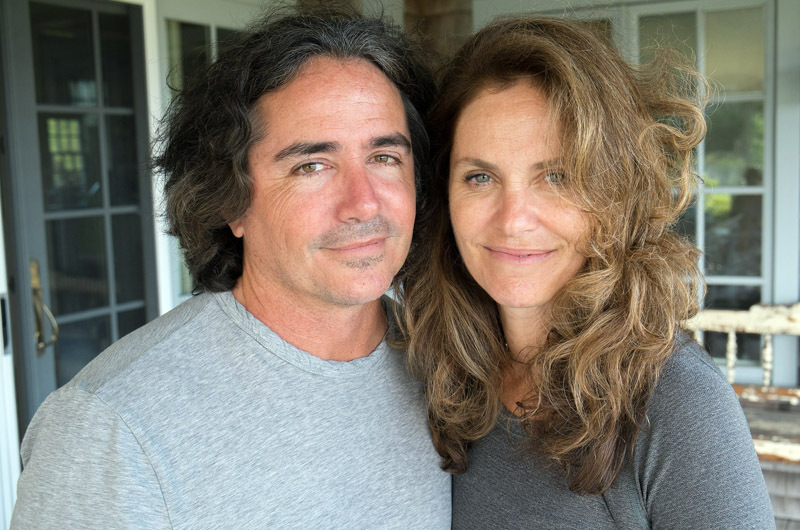 Looking peaceful and tan, husband and wife Brad Silberling and Amy Brenneman relaxed on a couch on the porch of their West Tisbury home, their dog, Pablo dozing nearby. With an osprey nest about 100 feet away, a blue pond in view and fragrant flowers sprouting up from the soft ground, it’s no surprise that this is their favorite place to unwind. Ms. Brenneman is an actress who has starred in numerous television series including Judging Amy, Private Practice and The Leftovers. Mr. Silberling is a film director whose credits include Moonlight Mile and the adaptation of Lemony Snicket’s A Series of Unfortunate Events. Away from Los Angeles, Ms. Brenneman and Mr. Silberling have found the Vineyard to be a place of both rejuvenation and inspiration. “It becomes this very creative place where the stakes are artistically high and financially low for me to just mess around,” said Ms. Brenneman. Mr. Silberling first became enamored with the Vineyard because of the movie Jaws. As a 12-year-old he visited the Island for a day with the explicit purpose of seeing the filming locations for the thriller. “Really, for all of my interest in the movie, I was sort of knocked out by the Island,” he said. The couple bought their first home in Chilmark in 2000 and moved to their current West Tisbury residence four years ago. Now, they try to spend a month to six weeks on the Island with their two children, Charlotte and Bodhi. Charlotte recently played Swan #4 in a Summer Stars production and Bodhi loves to jump off the Big Bridge at State Beach. Last week, Ms. Brenneman and Mr. Silberling taught a free class for kids on acting and filmmaking as part of the Cinema Circus wing of the Martha’s Vineyard Film Festival. 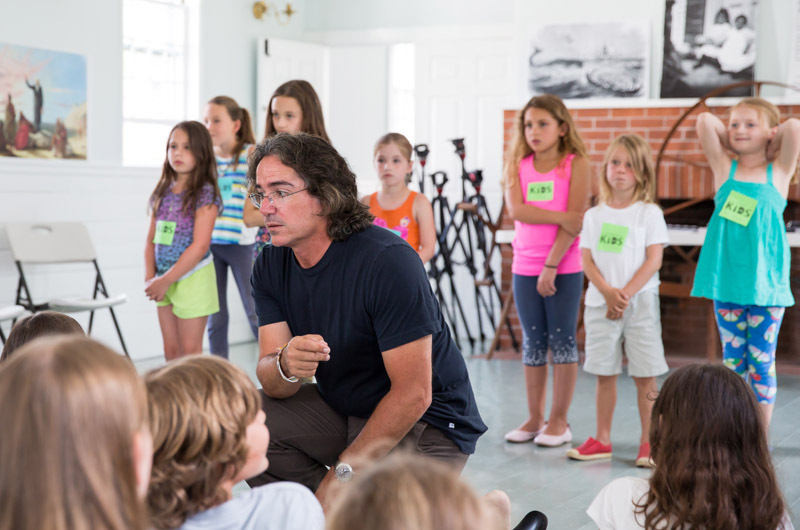 About 25 young aspiring actors, directors and a few kids whose parents made them come gathered in the Mayhew Schoolhouse in Vineyard Haven. They started with silent movement exercises and then sat in a circle on the floor. “What does it mean to tell a story?” Mr. Silberling asked them. 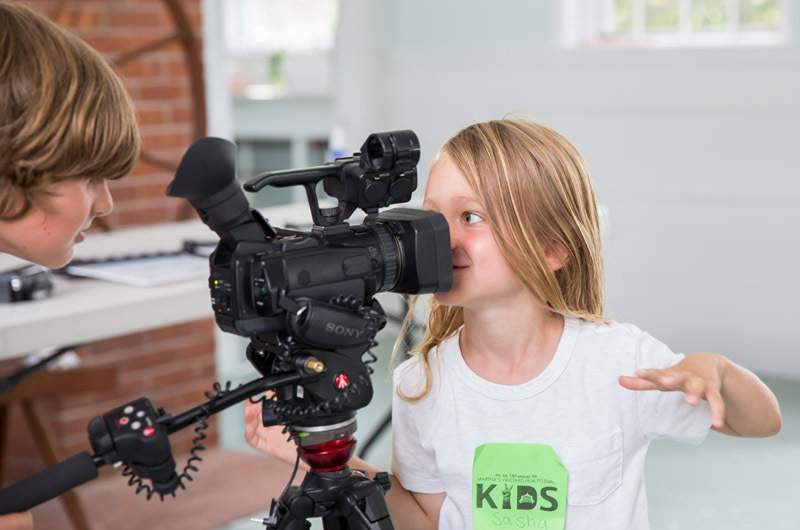 He then helped the kids explore storytelling through actual scenes, display emotions through actions and choose various camera angles from which to shoot a scene. Ms. Brenneman worked with the children from inside the scenes, providing acting lessons and then performing with the kids. When they were finished, even the parents watching had learned a lot. Mr. Silberling feels that the younger generation’s increased access to storytelling tools helps facilitate creative growth in young minds. He shared how their son Bodhi had recently shot a video on a friend’s phone, edited it with iMovie and sent it to him and Ms. Brenneman, all during a spell of boredom one afternoon. At heart, both feel that the essence of their craft, and what they want to pass on to others as teachers and audience members, is storytelling. Ms. Brenneman said her introduction to acting encouraged her to contribute to the construction of the story. In college, she founded a theatre troupe that adapted classics and wrote their own plays. She said she hopes to diminish the idea that acting is a people-pleasing task, and that the earlier aspiring actors discover that their thoughts matter, the better. “I always say, whose story is this? Sometimes it’s going to be my story and you will help me tell it, and sometimes it’s going to be your story and I’ll help you tell it,” she said. Mr. Silberling said people often don’t realize how collaborative the work of filmmaking is. He likened directing to being the conductor of an orchestra. Sure each section and individual is important, but they would be nothing without the other components. They both also dispel the myth of glamour surrounding their movie-making lives. Ms. Brenneman said a four person, two page scene can take six hours to shoot. “The tedium is always a shock,” she said. As audience members, Mr. Silberling and Ms. Brenneman said they enjoy shows and films that cross genre lines, as opposed to straight dramas or comedies. Mr. Silberling also observed that a breakdown in categories is occurring on the work side of the industry. Everyone is becoming a “content creator,” he said, with more of the on-screen familiars becoming directors and producers, while the off-screen creators bounce from TV shows to feature films to streaming services. Though their business relies on audiences, they both said that trying to pander to the audience is a disservice to creators and viewers. She said the moment creators try to use a formula to make a show, it dies. In addition to producing Heartbreaker, Jane the Virgin and Reign, Mr. Silberling will be filming a movie he wrote, An Ordinary Man, in Serbia this fall, traveling extensively for the first time for his career. Ms. Brenneman’s upcoming projects include filming for The Leftovers and Reign. They also hope to see workshops like the one they put on last week continue and expand on the Island. “I think if they did some of these workshops for adults they’d be surprised by the turnout,” said Mr. Silberling. I love reading articles in the Gazette about movie stars who vacation on Martha's Vineyard.